Marty has been on bootcamp for the past week. I’m afraid to say that I reached the point where I was about ready to give up entirely; even keeping in mind that he is of an age where rebellion is second nature to him, I just felt like owning him was one long struggle and I really wasn’t enjoying it. I felt jaded, and no longer looked forward to working with him. In fact, I dreaded it. 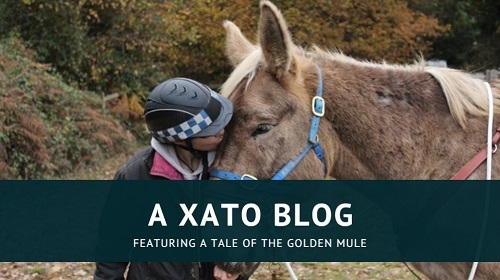 I loved him utterly and wasn’t put off mules – I enjoy the challenge and the rewards, when you get them, are fantastic – but I was beginning to wonder whether Marty and I just weren’t a good match. It happens. 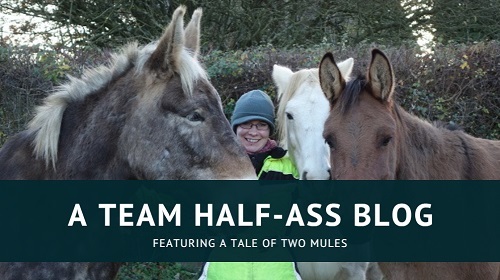 There are horses you just don’t click with, and I’m sure the same must be true of mules. 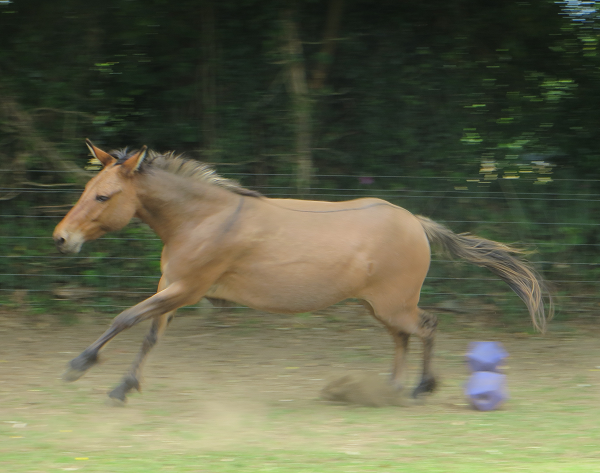 On the plus side, he is very photogenic when he’s storming around the field. I was aware that, if I wanted to part with him and send him on to someone new, we would still need to overcome the problems we’ve been having because it just wouldn’t be fair to send him out into the world like that. I explained to Ben that I wanted to send Marty away to a trainer for a few weeks, and we did some research and sourced a few who we felt would do a good job. Then Ben asked if I would allow him to take Marty on for a week first. See? He’s a pretty boy. 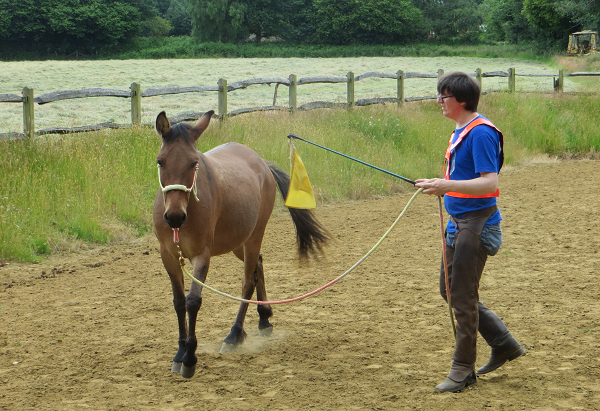 Although Ben had been helping me with the mule – I wouldn’t have got Marty if I didn’t think I’d have Ben’s support – I hadn’t yet asked him to take a direct role in training. This is mostly because Ben has a weekday job with long hours, teaches horsemanship on the weekends, and in his spare time wants to ride his mare; so I felt bad for encroaching on that. I’d hoped that I could get by with a weekly or bi-weekly lesson and having him around to help out as needed. 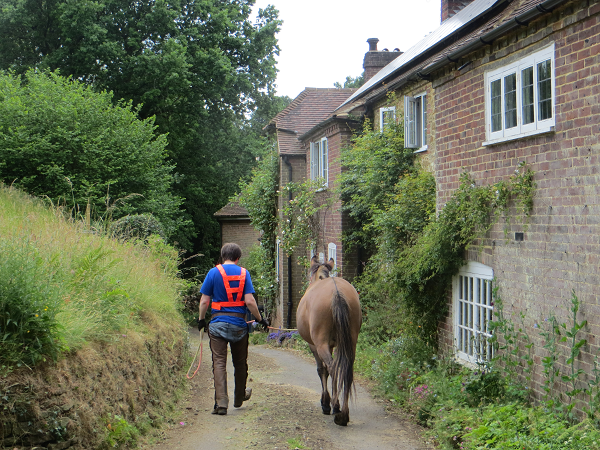 Also, Marty is my mule; I felt like I needed to be the one to do the training, albeit under supervision, because it was with me that Marty would need to work. And yes: you can roll your eyes at me for being an incompetent newb. I deserve it. Long story short, this week has worked wonders on Marty’s attitude and behaviour. Whereas I had been working on the theory of little and often, Ben worked him for between one and two hours every day. He focused on being very concise and clear with his requests, so that there was no grey area and Marty knew what was and wasn’t acceptable. Catching time went from 45 minutes on Monday to walk-up-and-halter on Saturday. Today it went back up to 13 minutes, as we gave Marty a day off yesterday (I only haltered/unhaltered him). I was a little disappointed that he would revert so quickly, but this just shows that we need to keep working on it. …Except for when he’s being a Horrible Nasty to poor Cash pony. Marty is also wearing a saddle again! After the fiasco when it slipped round his belly, I haven’t been able to put so much as a nummnah over him without him flinching and trying to pull away. 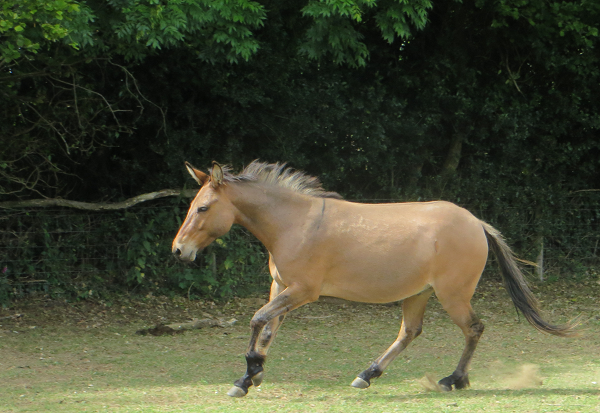 So for him to be able to wear a saddle – girth and all – in walk and trot, after just five days work, is fantastic. Marty doing a little arena work before we took him out. Today we took him for a walk off property, which is something else that we’re having to treat like a new thing. He has hardly been out since the incident with the dogs, because I’d intended to get Ben to come out with me the next time; but I wanted to wait for Stacey to see him first, and then life got in the way, and then he started all this nonsense with catching and rearing and those were things that we had to get fixed first. 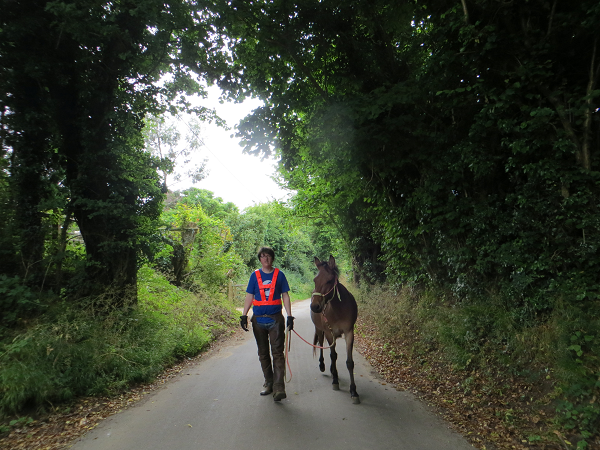 It was only a short walk up the lane and back, but he was a very brave boy by walking past some potentially dangerous Duke of Edinburgh students (they had huge rucksacks and sticks! Who knows what they had planned for a poor defenseless mule!) even if he did have to turn himself inside and out like a Quaver crisp first. He never actually tried to pull away or run for home. So basically, we are in a much better place and appear to be getting back on track. I still can’t say for certain whether Marty and I will be together for the long run; I don’t want to part with him, but we have both suffered a knock to our confidence and that does not make for a good combination. If we do part, it will only be after we’ve given him the best start to finding a good human that we possibly can.